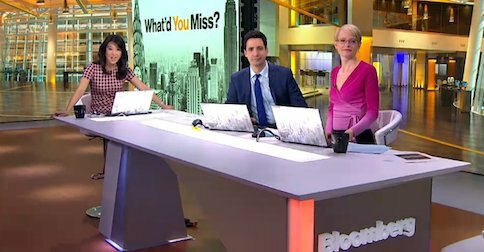 This week I came across a show on Bloomberg television whose written title I misinterpreted. The show is What’d You Miss? What might the contraction ’d stand for? I took the ’d in What’d You Miss? to stand for would. I guessed that the show posed the question what would you miss if some circumstance were true – eg what would you miss from home if you emigrated? I guessed wrong. It turns out that the show begins at the daily closing bell of the New York Stock Exchange, and discusses the investment opportunities of the day just finished. The title means What did you miss? Personally, I’d prefer to write such a pronunciation as What d’you miss? rather than What’d you miss?, as it’s closer to the pronunciation. During my years as a professional writer of screen dialogue I would probably have used the former. But perhaps the latter spelling is more established in America. Of course, since these contractions are informal, they’re not written that much at all. The second of the TV hosts in the clip above turns d’y into /dʒ/, by a process which phoneticians call ‘yod coalescence’. This shows that the residual form of did is attached to the start of you, and not to the end of what. https://www.englishspeechservices.com/wp-content/uploads/2015/11/Whatd_you_miss.jpg 252 484 Geoff Lindsey https://www.englishspeechservices.com/wp-content/uploads/2019/03/blue-mono-logo-small.png Geoff Lindsey2015-11-09 00:01:162015-11-09 13:16:25What'd you miss?